NEW YORK - There will be no shortage of high moments for future VirginGalactic passengers set on a suborbital ride aboard a SpaceShipTwo spacecraft,a pilot who tested the vehicle's predecessor said Friday. "Everythingyou see with your eyes is 'Wow,' and everything you feel with your body is'Wow,'" test pilot Brian Binnie told a packed crowd here at Wired Magazine'sNextFest forum. "It's literally like you've been carried away." Binnieshould know. He piloted SpaceShipOne- the precursor to SpaceShipTwo (both designed by aerospace veteran Burt Rutan) -when it clinchedthe $10 million Ansari X Prize for privately-developed suborbital andreusable spacecraft. "SpaceShipOnewas a handful and we're building SpaceShipTwo to make it a much morepilot-friendly experience," Binnie told a crowd of more than 300 people, nearlyall of whom raised their hands when asked if they hoped to fly in space. "Wethink it's going to be a much more manageable experience than SpaceShipOne." Built byRutan's Mojave, California-based firm Scaled Composites, SpaceShipOne reachedan altitude of nearly 70 miles (112 kilometers) in 2004 when Binnie pilotedthe air-launched vehicle into suborbital space on its third flight. His fellowtest pilot Mike Melvill flew SpaceShipOne's two previous flights - includingone that featured a series of unexpectedrolls during launch. 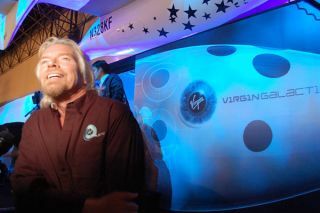 Shortlyafter SpaceShipOne's historic flights, British billionaire Sir Richard Bransonannounced plans for the Virgin Galactic fleet of five SpaceShipTwo vehicles -also to be built by Scaled Composites - to carry paying passengers intosuborbital space at a starting ticket price of $200,000 each. Branson unveiled aconcept interior for his Virgin Galactic SpaceShipTwo vehicles, which aresaid to be three times larger than SpaceShipOne, on Thursday. "It's amuch larger ship, and we have a much larger space," said Alex Tai, VirginGalactic's vice president of operations, during a panel discussion today. "You'll really get a chance to see the majesty of the Earth you've just leftonce we get into space." SpaceShipTwoand its massive carrier plane WhiteKnightTwo are slated to begin initial testflights by early 2008 with operational flights to follow by 2009, VirginGalactic officials said, adding that they will base initial space shots out ofMojave, California before transitioning to a New Mexico spaceport. Unlike SpaceShipOne,which carried one pilot per flight, Virgin Galactic's SpaceShipTwo vehicleswill carry six passengers and two pilots, and could even be modified later tocarry a 1,763-pound (800-kilogram) science payload into suborbital space forabout $2 million should the market demand warrant it, the spaceline's presidentWill Whitehorn said. But Virgin Galactic's target market remains thrill-seekingpassengers eager to view their home planet from afar while grabbing a few uninterruptedminutes of weightlessness, Whitehorn added. VirginGalactic officials said the passenger-carrying SpaceShipTwo has been designedsuch that a full 85 percent of the world's population could qualify for a2.5-hour flight towards suborbital space. Tai saidthat prospective passengers would receive a simple medical form that their owngeneral practitioner could use to decide whether if they met the standardSpaceShipTwo health guidelines. Passengers-to-be would then meet with VirginGalactic medical personnel for a more in-depth analysis, he added. "It reallydoesn't matter if you're 80 years old or 10 years old," Tai said. "We'vedesigned a ship that makes the physical effects of the flight quite benign." VirginGalactic officials said more than 65,000 people have registered their interestto ride a SpaceShipTwo vehicle into suborbital space, with more than 200already reserving their seats by making a payment deposit. "Theatmosphere in there is going to be bristling and electric," Binnie said ofSpaceShipTwo flights. "If you are not happy when you're weightless, thensomething's wrong."